Everyone's favorite chocolate ice cubes are now available in dark chocolate. You get a solid chunk of dark chocolate that will melt in your mouth. A Delicious smooth rich dark chocolate flavor in every bite. For those who like dark chocolate you are going to love these. They have a dark chocolate iced flavor that is hard to resist. Once you eat one, you will be craving another one before you know it. 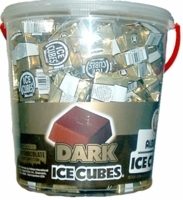 For those milk chocolate lovers we also have the original ice cubes too. Please keep in mind that these are a very delicate chocolate and melt very easy. When ordering in temperatures over 65 you will need to add ice packs and ship air methods to help them from melting. Each tub has 120 chocolates, tub is resealable to resist temptation.